With ‘the fruit basket of the world’ as an epigraph for India and the recognition of food processing as a priority sector in the new manufacturing policy in 2011, a large number of food and fruit processing players have forayed in the industry. Interestingly, as per the National Horticulture Database published by National Horticulture Board, India produced 86.602 million metric tons of fruits during 2014-15 which shows a significant increase as compared to 71.516 million metric tons in 2010. Application: Beverages, Dairy, Frozen, Jams, Spreads, Soups, Sauces, etc. Type of Fruits Used: Pineapple, Mango, Banana, etc. The major markets for processed fruit products are the European Union, the Middle East and the USA while the beverage industry is the biggest customer of fruit purees and pulps. What the Future Holds for the Industry? The existing and new players of the fruit processing industry are eagerly waiting for the future to reveal the various benefits that it has for them. Currently, under the Make in India initiative, a total of 42 Mega Food Parks are being set up. They have around 1,250 developed plots with basic infrastructure for setting up of food processing units. Also, 134 cold chain projects are being setup to develop supply chain infrastructure. As on 22.07.2016, out of 134 Cold Chain Projects 87 projects have been completed. Shimla Hills, one of the leading and renowned names in the agro-food products industry, is laced with advanced technology, top grade quality-check lab, premium quality packaging options. 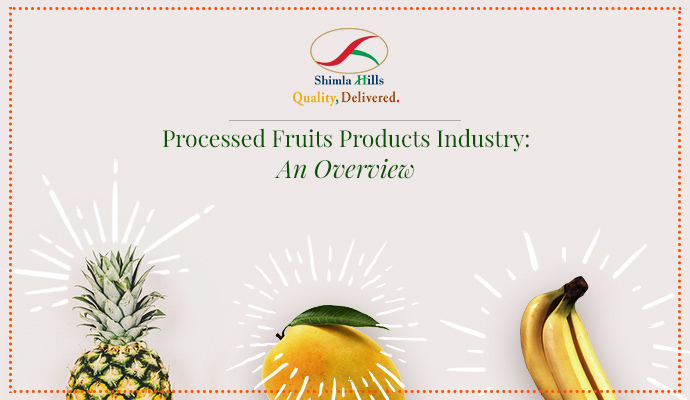 All these factors hold a paramount importance to deliver top quality fruit processed products such as pulps, purees, fruit concentrates, IQF, etc. at a competitive price.